Pictured are members of the Kairos Prison Ministries (back from left) Larry Wood, Kaylan Wood, Rob Goodloe, Dustin Stock, Luis Valdez, Royce Pearson, (front) Lynette Wood, Bobbie Goodloe, Wandean Stock, Jerlisah DeLaRosa, Aluena Peña, Robbie Pearson and Ginny Bush of the Chase Foundation. 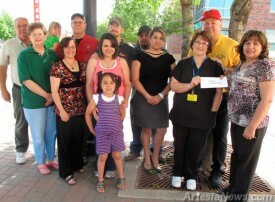 The Chase Foundation donated $2,500 to the organization in January. The donation will support Kairos Prison ministry Kairos or weekend-long retreats which give selected inmates the opportunity to reconnect with God. According to wikipedia.com, the word Kairos is Greek in origin and literally means “a right, opportune or supreme moment.” The word was adapted by apostles in the New Testament to mean “the appointed time in the purpose of God.” Kairos Prison Ministries simply defines Kairos as “God’s special time.” Royce Pearson said the goal of Kairos is to build a Christian community in the prison environment by having monthly reunions with the Kairos alumni who have attended a weekend. “We want to thank the Chase Foundation for all its support. It has been a very generous donor to our cause,” said Pearson.